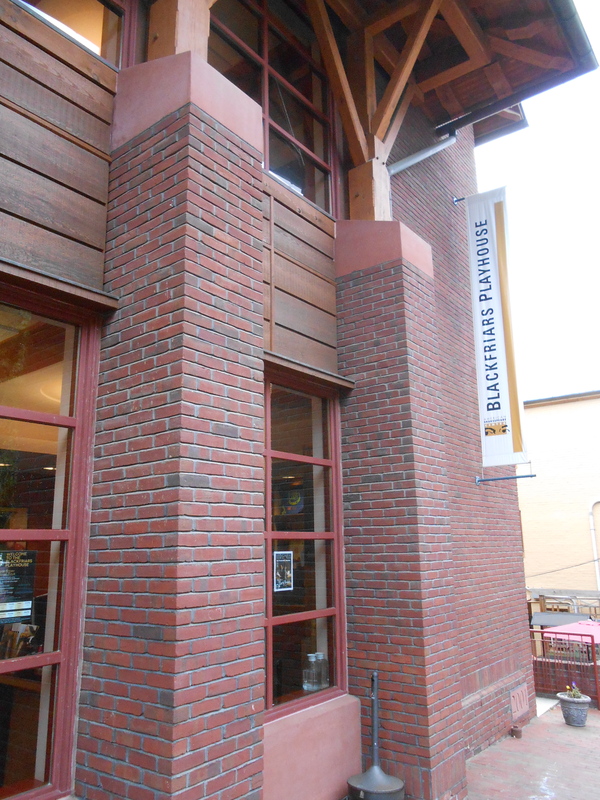 Last time we were in Virginia we went and saw The Taming of the Shrew at Blackfriars Playhouse and greatly enjoyed the atmosphere. Their tagline is “We do it with the lights on” because like Shakespeare’s original Blackfriar’s indoor theater they leave the lights on during the performance. (what use to be chandeliers of candles). In shakespeare time their actors could see the audience and vice versa, so they make sure this is true today as well. They try and follow several of Shakespeare’s rules, but in their own way or twist, such as the only men performed in the past, instead of having an all male theater troupe they play with the gender of characters, so men may be playing the parts of woman and woman men. There was also music that was performed in the old shows and so when you come in the actors and actresses will be upstairs in the balcony playing instruments and singing songs that you may or may not recognize and be able to sing along, they also perform and sing during intermission. Throughout the performance there may also be bits and pieces of music, some that are original from the play, others you may also recognize from other things. Like at one point in Macbeth there was a little bit of a song from Annie. They have fun, and since they can see the audience they interact with the audience. My sister during a humorous part in the performance ended up chatting with the character for a bit. We attended Macbeth on a Thursday, and after the show they pulled out chairs and the actors came out and answered questions the audience had. After shows in general, after everyone has left the stage people can find a worker and ask to go back in to take photos, since photos are not allowed during any time performers are out and about. We were going to go back in, but when we realized there was a Q+A and if we stayed through it we would get back to the bunkhouse super late we just went home.